The art of Leila Khoury is both powerful and deeply personal, and responds to the continuing horrors of the Syrian Civil War. The conflict, now in its seventh year, began during Khoury’s time as an undergraduate art student. Her family’s deep roots in the country inspired her to create work focusing the effects of the conflict. Two works by Khoury on view in Heavy Metal directly reference places damaged by the war. 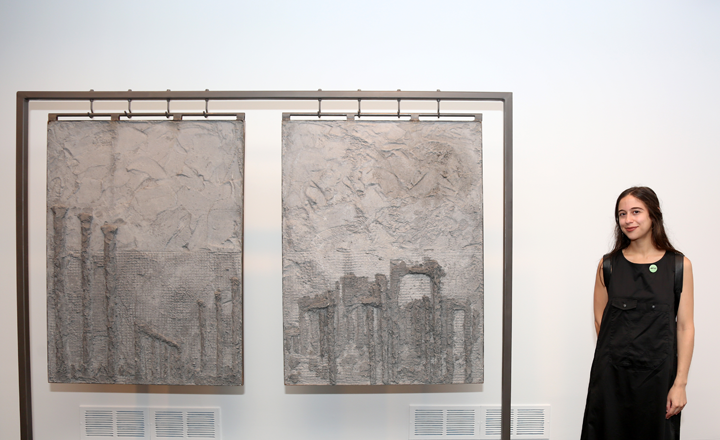 Palmyra (2015) is a large pair of hanging concrete slabs, with the forms of ruins emerging from the rough grey material. Violence caused considerable damage to the ancient city in 2015. To create the work, Khoury spent an hour attempting to build an image of the city without consulting any photos. “It was a really spiritual experience because I was having to face the fact that I might never see this place [again] in my life while I was making it,” she says about the process. This entry was posted in Artist Spotlight, NMWA Exhibitions and tagged Heavy Metal, Leila Khoury, Women to Watch by Women in the Arts. Bookmark the permalink.